Scott Mooney scored for Deeping Rangers at Harborough. Spalding United’s stay at the top of Division One South of the Evo Stik Northern League proved to be brief. A 0-0 home draw with lowly Kidsgrove enabled Shaw Lane to leapfrog them back to the summit with a 3-1 win over Market Drayton. Spalding had been top for five days. Jezz Goldson-Williams scored twice for Peterborough Northern Star at Oadby. The top two meet at the Sir Halley Stewart Field next Saturday (January 14). They are four points clear of the rest of the division. There was some rare recent joy for Stamford AFC as they picked up their first away win in six attempts at this level. Second-half goals from Delroy Gordon and Jack Duffy secured a 2-0 win at Belper Town and lifted the Daniels into 16th place. There was only despair though for neighbours Blackstones who played under the management of Andy Lodge for the first time in United Counties Division One and lost at home to Irchester 3-1. Stones gave a debut for Jake Pell who moved from Yaxley Fc to rejoin his former Whittlesey Athletic boss. Blackstones are 16th in a 19-team league, just two places, but seven points behind Bourne were crashed 5-0 at second placed Olney today. 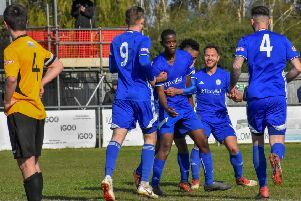 In the Premier Division there is still no stopping Deeping Rangers who made it 20 top-flight games unbeaten with a 3-1 win at Harborough Town. Jason Kilbride, Scott Mooney and Luke Hunnings scored for Deeping who eased clear after the break after the teams had traded first-half goals. Deeping are third, a point behind second-placed Eynesbury and three points adrift of leaders Peterborough Sports. Yaxley are fifth after coming back from 2-0 down to beat Rothwell Corinthians 3-2 at In2itive Park. A Dan Cotton penalty, plus goals for Charlie Saunders and Wayne Morris secured the turnaround, although manager Brett Whaley admitted his side had received the rub of the refereeing decisions. Holbeach are seventh after losing 4-0 at Desborough, a defeat that prompted Seb Hayes to describe the final 30 minutes as ‘embarrassing’. John Fairweather was sent off two minutes after Adam Millson had equalised for Wisbech in a 1-1 home draw with Wellingborough Town. Jezz Goldson-Williams struck twice for Peterborough Northern Star, but the city side were robbed of victory at Oadby a 94th-minute volley. Oadby had also scored in the opening minutes of a 2-2 draw. March Town United were also thwarted at the death in the Thurlow Nunn Eastern Counties Division One match at AFC Sudbury Reserves. Debutant Toby Allen scored the March goal in a 1-1 draw. Spalding 0, Kidsgrove Athletic 0. Oadby Town 2, Peterborough Northern Star 2 (Goldson-Williams 2). Yaxley 3 (Cotton, Saunders, Morris), Rothwell Corinthians 2. Olney Town 5, Bourne Town 0. AFC Sudbury Res 1, March Town United 1 (Allen). King’s Lynn Town Res 1, Wisbech St Mary 2.